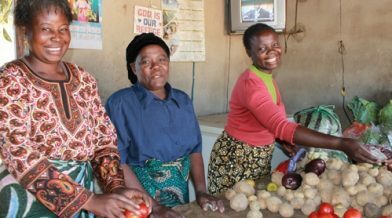 FINCA helps Zambians living in poverty access financial services to improve the quality of life for themselves and their families. In recent years, Zambia has made significant strides to improve its economy. Yet, 60 percent of Zambians still live below the national poverty line. The high incidence of HIV/AIDS, in particular, has devastated families and communities and has left a society dealing with a rising number of AIDS orphans. Zambia, along with much of sub-Saharan Africa, is on the verge of a crisis. By 2035, the International Monetary Fund estimates the number of Africans joining the working age population will exceed the rest of the world combined. To fill this surge, 18 million new jobs will have to be created each year for the next 20 years across Sub-Saharan Africa. In the meantime, Zambians rely on the informal sector for a chance to earn a living. When poor people have access to financial services, they can earn more, build their assets, create jobs, and cushion themselves against external shocks. Since 2001, FINCA International has been helping thousands of Zambians improve their lives. FINCA offers financial services, such as loans, savings and microinsurance, throughout the country. 2 Population lacking account at formal financial institution.